Greek Easter! It’s that time of the year again to make these delicious treats! These butter cookies are one of my all-time favorite Greek cookies, and I think I could probably eat this entire recipe to myself. However, we “must” share, right? These Greek cookies, which are based in butter, are a semi-sweet treat the carries hints of vanilla and sugar. Yes, you read right: butter, vanilla, and sugar - what isn’t there to like about these? 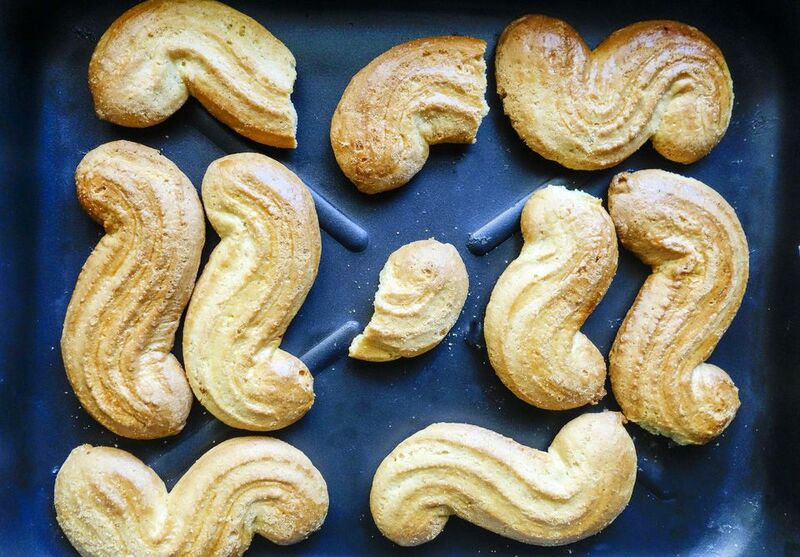 Traditionally, these Greek cookies are braided like in the picture above; however, some people get a bit creative and make many different shapes. So, if you’re doing this with young ones - let them be creative. After all, that is what cooking is all about - having fun! In this recipe, we decided to use cognac because I had some left over from all the Greek Christmas cookies, but you can omit it or substitute it out for ouzo, which is a popular choice. I want to point out that the key to making these successfully is making sure you cream the butter. If you have never done this before, I’d recommend checking out a Youtube video. The first time I made these, I “thought” I knew and it didn’t end so well. The process takes about 12 to 15 minutes with a mixer.You’re looking for the butter to double in volume, and peak while you’re whipping it. If you want to really connect with the ways old the old, you could do it by hand, but I wouldn’t recommend that unless you like stirring butter in a bowl for 30 to 40 minutes. After butter is done, slowly mix in sugar. Next, while continuously mixing, add egg yolks, one at a time, followed by cognac, and vanilla. In a separate bowl, combine baking soda and flour. While mixing, add flour slowly to butter mixture. Keep stirring until soft dough forms. Take about 2-inch pieces and roll out with your hands. Take long piece create an upside down V, now braid pieces together. Place koulourakia on a baking sheet lined with parchment paper. Now, create egg wash (combining egg and splash of water) and brush mixture over each cookie. Top with sesame seeds, to preference. Place in preheated oven at 350F for 20 to 25 minutes, or until golden brown. Remove, let cool on a plate, and serve! You can either make the "V" shape, or use a different method that some find easier to do. You can roll out the dough piece, break it in half and create two even pieces. Laying them side-by-side and pinch the tops together and braid the two pieces together. They may come out soft, but they will harden. I recommend having a nice cup of Greek coffee or a favorite hot drink to dunk them in.